Today, homesteading focuses on self-sufficiency without compromising your bank account. An article posted on the Mother Earth News website stresses that homesteading need not be costly, but rather cost-efficient by using less energy and promoting local goods. Likewise, the entry highlights that homesteading can be a conscious effort that brings together families and communities. Homesteading can be done by anyone in any location, and can be achieved even with limited resources. In this article, we will walk you through several steps to make the most out of your limited budget and effectively carry out the activity despite the lack of resources. Today’s concept of homesteading revolves around the idea of self-sufficiency at the least expense possible. Here are few friendly tips to kick start on homesteading. Bartering — Homesteading experts say that bartering is an effective way to cut back on certain expenses such as food. Experts also note that even livestock can now be bartered. Buying used items — Purchasing used items and equipment is a surefire way to reduce unnecessary costs. For instance, buying a secondhand car might be a more practical choice compared with buying a new one, where a monthly payment may slash a big chunk on your income. Learning how to sew — An entry published on The Real Farmhouse website highlights the importance of learning how to sew to cut back on spending. According to the article, being equipped with at least the basic sewing techniques may help the household save dollars as torn clothes may simply require a few stitches or so, and need not be replaced with new ones. Getting excesses from others — Asking your friends and neighbors for excess seeds, plant materials, and even animals may effectively reduce spending. 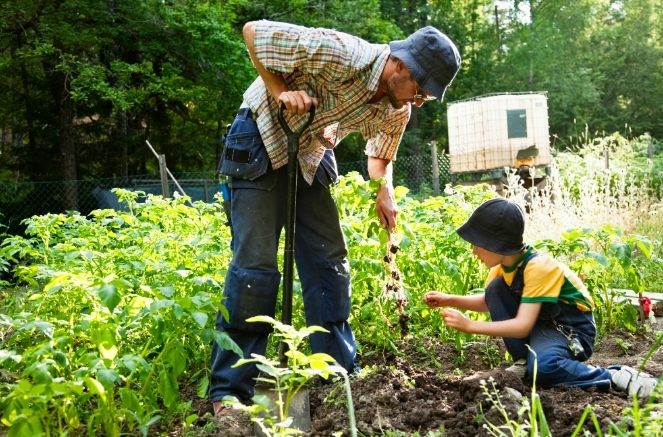 Starting your own garden — Home gardening has always been a big part of homesteading. Growing your own produce not only saves money but also ensures the quality and nutritional content of the crops you tend to. Looking for income opportunities — Organizing the household and selling unwanted items and clutter may provide a small but otherwise considerable income. It is also advisable to take various odd jobs when possible to augment the family income, according to an article posted on The Prairie Homestead website. Cooking from scratch — Poultry, livestock, and home gardens are worthy investments as they allow you to grow and enjoy products that can be easily found in supermarkets such as milk, eggs, and red meat. This means that the food budget can be allocated to other items that more challenging to produce such as dried nuts. Making everything yourself — Learning the basics of home keeping and maintenance may help incur significant savings as you no longer need to pay for professionals to check on the roof, plumbing, and other upkeep staples. Foregoing luxuries — Another entry featured on The Prairie Homestead website stresses the importance of foregoing luxury to optimize savings. The article notes the reducing trips to the restaurants and cinemas and forgoing costly vacations may boost the household’s savings.